From Goodreads: Taylor’s family might not be the closest-knit – everyone is a little too busy and overscheduled – but for the most part, they get along fine. Then they get news that changes everything: Her father has pancreatic cancer, and it’s stage four – meaning that there is basically nothing to be done. Her parents decide that the family will spend his last months together at their old summerhouse in the Pocono Mountains. It's a pretty well known fact that I LOVED Morgan Matson's debut novel, Amy & Roger's Epic Detour (you can read my review of Amy & Roger's Epic Detour). When I heard Matson had another book coming out I immediately starting counting down the days. Then of course life got in the way and I was busy and I completely forgot that the book was out until a week after it was released. 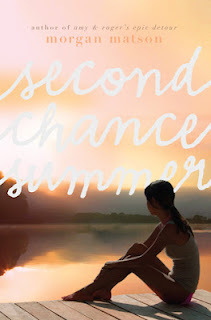 So what did I think of Second Chance Summer? LOVED it. But in a much, much different way than Amy and Roger. Side note: Amy makes a quick, blink-and-you'll-miss-it appearance in Second Chance Summer. Warning: this book will break your heart. It will remind you of all the emotions you've gone through when you've lost someone close to you. That is what made me love this book as strongly as I do. While those emotions are heartbreaking and reliving them is never fun, I love that Matson was able to convey all of those feelings in her writing. A box of Kleenex is necessary to get through this book. Ladies, no eyeliner. You'll end up crying it off. I do want to mention that the entire book is NOT depressing. Happy things do happen to the characters! I know this wasn't much of a review but I honestly cannot get the thoughts in my head to form complete sentences. The library should be handing out boxes of tissues with this book! I hope you like it! I think I want to read this one. I love books that make me cry, especially when they can do so without being depressing. You definitely want to read this book! I'm in the middle of reading this and am loving it. Morgan Matson deserves a wide readership with this one. Let me know your thoughts on the book once you finish it! Yep. That's all I've got too. It's hard to put into words how much you love something sometimes! You must give the book a chance! I was super sad reading this one. I wasn't big on the love interest plot thread, but the scenes with the dad? Oh, wow! I thought the love interest plot was okay, it seemed a little predictable but I'm glad it was there to balance out the sad parts! Glad to hear you changed your mind! Let me know what you think of the book after you read it! I read this book before Amy and Roger's Epic Detour so I missed Amy's blink and you'll miss it cameo. Now, thinking back I can't think of when it would have been. Can you jog my memory or tell me when it occurred? I had it from the library or I'd read it again looking for it.